Nevi (moles) are benign lesions composed of collections of nevus cells of neuroectodermal origin. They appear in childhood, tend to increase in number throughout the adult years, and then resolve with age. Pigmented nevi can be flat, raised, or pedunculated and have impressive variations in size, color, and surface characteristics. Histologically, junctional nevi are located in the epidermis, intradermal nevi in the dermis, and compound nevi in the epidermis and dermis. Junctional nevi are flat and pigmented, intradermal nevi are raised and often not pigmented, and compound nevi may be raised and pigmented (Figs. 33-8 and 33-9). Unless they become suspicious for melanoma, nevi need not be removed except for cosmetic reasons or because of chronic irritation based on their location. Nevi should be examined frequently, however, for changes in color, shape, or size. 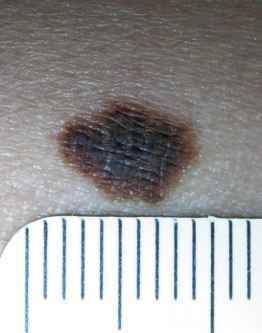 These changes may herald the onset of a melanoma in a previously benign nevus and warrant excision with pathologic evaluation of the tissue. 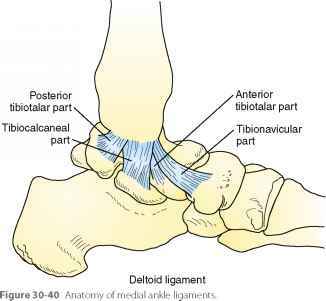 removal of all congenital nevi. 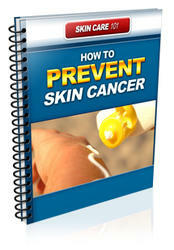 It is even controversial with regard to removal of large, "bathing suit" nevi, which have the highest risk of melanoma. Children born with these nevi are at risk for developing melanoma in the central nervous system (CNS) as well as subcutaneous melanoma, which is not visible and requires palpation in order to detect on routine skin examination. 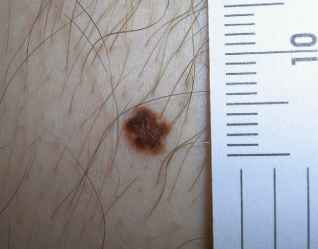 Dysplastic nevi (atypical moles) are markers for increased risk of melanoma somewhere on the body. These nevi have more atypical features but are not at high risk of converting to melanoma (Fig. 33-10). Therefore, removing dysplastic nevi does not provide a survival benefit for patients. The presence of five or more dysplastic nevi should alert the patient and physician to this higher risk of melanoma, and therefore regular skin examinations should be performed, with sun avoidance and sun protection.